Will the budget offer some solution to public transport issue? "How the buses run on the city routes during the peak hours of the day scaring all other road users to death is ample testimony for the dire need to put an end to the current primitive system of operating buses. The question is how the proposed system can be implemented without getting bus operations in each district under the control of one single authority"
The budget among its many proposals which have received mixed reactions seems to contain some valuable suggestions targeting the much needed modernization of the public transport sector. It has clinically looked at the public transport sector identifying some of the main causes for its chaotic situation today. The approach has been to look at it from a long term perspective rather than proposing some quick fixes. However, going by the history of our budgets and their implementation most Sri Lankans would be quite skeptical until these proposals are fully implemented. Overall, the Budget 2019 which is before the Parliament appears to be one instance where problems of public transport have been looked at rationally at least. The most significant proposal is the idea of getting the revenue from all buses into a Revenue Support Fund as a transitional arrangement and paying the bus owners on monthly basis for the number of kilometers operated. This could be a solution to the central issue right now which is the unhealthy competition to collect passengers at the expense of the safety and convenience of both commuters and pedestrians on the road. How the buses run on the city routes during the peak hours of the day scaring all other road users to death is ample testimony for the dire need to put an end to the current primitive system of operating buses. The question is how the proposed system can be implemented without getting bus operations in each district under the control of one single authority. The rat race for a bigger daily revenue collection is an inherent problem in a public transport service operated with individually owned buses. Most buses are bought with leasing facilities from financial institutions and as a result bus owners fix a high daily target for the crew. The wages of the bus crew depend on the volume of the daily collection. The situation is made worse because there is no practice of issuing tickets to the passengers which has given the opportunity for the drivers and conductors to pilfer whatever the collection made over and above the stipulated daily target. It should also be noted that every attempt by the authorities to make issue of tickets compulsory in the past has been resisted and stifled by the bus operators. At the moment there is no employment security, proper salary structure or EPF and ETF benefits for those employed in the private buses making the situation worse. Drivers and conductors in this sector lack any permanency of employment or social status quite in contrast to the situation prevailing in countries where there are well developed transport systems. 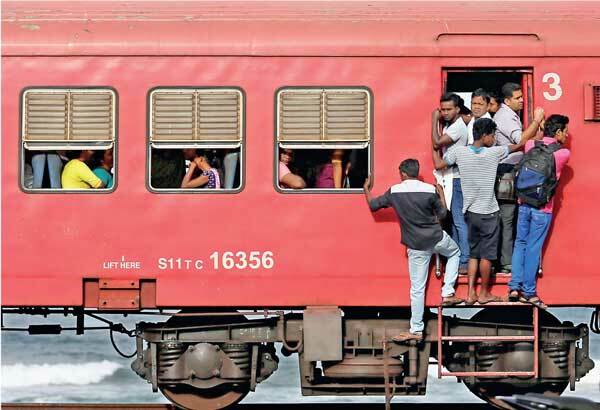 Drawing attention to this issue, Finance Minister Mangala Samaraweera, in his budget speech, said that private sector bus employees will be given better job security with EPF and ETF benefits and will be eligible to get loan facilities as an incentive for better service towards passengers. It is a fine idea, but it is necessary to have some sort of permanent employment for them before this could be introduced and it is doubtful whether such a system can be implemented under a regime of individual bus operators. The poor quality of buses in the public transport system at the moment is another huge issue. It is a known fact that the majority of buses belonging to both private sector operators and the SLTB are goods transport vehicles converted into passenger buses and as a result they lack the standard comforts found in original passenger transport vehicles. When these buses were introduced to our roads several decades ago only very a few people owned motor vehicles. The income levels of the people were quite low and nobody looked for comforts. Today the situation has completely changed and people look for more and more comforts and that is why there is a major shift from use of public transport to private motor vehicles. Finance Minister admitted that fact when he said “Our transport sector is yet not meeting the needs of a middle-income county.” As a remedy he proposes a Bus Modernization Program in the next five years to transform bus services across the country. It is proposed to expand the SLTB’s fleet with addition of 250 buses with safety and user-friendly standards in the next two years while they will also introduce buses that are more suited for those with special needs. A concessionary loan scheme ‘City Ride’, under ‘Enterprise Sri Lanka’, has been proposed where the Government will bare 75% of the interest cost for private bus fleet owners to expand their fleets by a total of 1000 luxury buses. The private bus owners who are willing to purchase luxury buses instead of the existing old buses and the reputed companies who are willing to provide comfortable transport services for their employees will be entitled to this loan facility. Under this scheme the maximum loan amount will be Rs 10 million with an annual effective interest rate of 13.86% while 75% of the interest will be borne by the government. The repayment period will be five years including a one year grace period. There are proposals aimed at upgrading and systematic phasing out of three wheelers which now have become an integral part of our transport system. ‘Mini Taxi / Electric Three Wheeler’ scheme under ‘Enterprise Sri Lanka’ will be introduced to upgrade current three wheelers into electric three wheelers and small cars that will be more environmentally friendly, safer and comfortable. Persons who are 35 years of age or above, who own three-wheelers currently used for hiring purposes will be eligible for this loan while the existing three-wheelers should be disposed. The maximum loan amount available under the scheme will be Rs 2 million with an annual effective interest rate of 13.86% while 75% of the interest will be borne by the government with a repayment period of five years. There is also a proposal to introduce within the next few months, starting with the Central and the Western Provinces, pre-paid fare cards, electronic tracking of buses, using GPS and information on next bus and bus schedules, delivered to the palm of the passenger through mobile applications. Modern multimodal passenger terminals will be introduced starting from Makumbura and will include Kandy, Kadawatha, Pettah and Moratuwa. The budget also proposes to establish a Joint Bus Operations Control Centre connected to live digital data streams throughout the country to make bus transport an attractive option. The budget proposes to allocate Rs 1300 million to support these investments. Recognizing the significant demand for improved railway services in the country, it has also been proposed to enlist the support of the private sector. In this regard, the minister proposes to allow the private sector to lease/rent Sri Lanka Railway’s carriages, and improve their facilities in the four main lines. These proposals together seem to have the potential to bring about some fundamental changes in our public transport system without resistance from any segments connected to the transport industry both in the state and private sectors. Theoretically at least, this seems to be a good beginning because more effective remedies like getting the private sector capital and management skills into government owned bus transport services or railway networks is not possible without facing resistance and much disruption in our country under the present circumstances. However, as the saying goes the proof of the pudding is in the eating and the country has to wait and see how much of these seemingly good proposals would be effectively implemented during the period covered by the Budget 2019 that is expected to be passed by the Parliament this week.